There are new clothes to wear. Beautiful flowers. At the ceremony vows and rings are exchanged. Then there is the party that includes speeches, music, dancing and yummy cake. 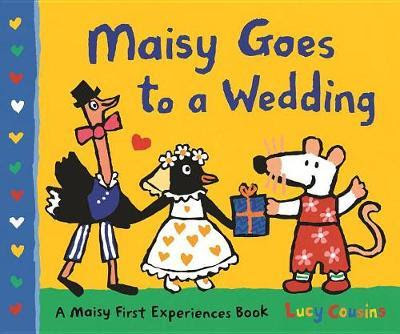 Lucy Cousins gives little readers a wonderful taste of a first wedding experience in her story, Maisy Goes to a Wedding. Announcing Ostrich and Penguin's wedding to readers by making the book's name plate an invitation is a lovely touch. Cousins has not given Maisy a role in the wedding party and as a guest Maisy is able to observe all parts of the wedding just like the readers. Cousin's has illustrated the story with her stylised bright and colourful illustrations that feature all of our favourite characters especially one of my favourites, Tallulah as the flower girl. Charley is been given a huge role; he walks Penguin down the aisle, holds the ring pillow and gives a wedding speech. Maisy Goes to a Wedding is a lovely read-aloud story that will have you wondering who caught the bouquet. Other first experience books about Maisy include; Maisy Goes to the Bookshop, Maisy Goes to the Cinema, Maisy Goes by Plane and Maisy Goes to the Library.